I went to see the Nada Dada event on Sunday (Father's Day), with my Paps and my son. It was a really groovy show, too bad I didn't get to see more of it. Next year I'm going to make a point of seeing it when its in full swing, or even better, to be a part and it and get a room at one of the Nada Dada motels. The Nada Dada event is where a large group of artists rent rooms in various "older" motor lodges and motels around downtown Reno then the artists modify the rooms by taking out the beds and what ever else they feel like to set up their own little gallery of personal work. For four days the artists can sell works and interact with the community of artists and art lovers. This is a great event for Reno, I wish we had more events of this kind. We made it to the El Ray motel, on Arlington and to the Wildflower Village, on West 4th Street. Most of the rooms were closing up shop by the time we got around to them, but from what was left there were some was really good artists. The rooms that I enjoyed the most at the El Ray were Alice in NadaLand room. 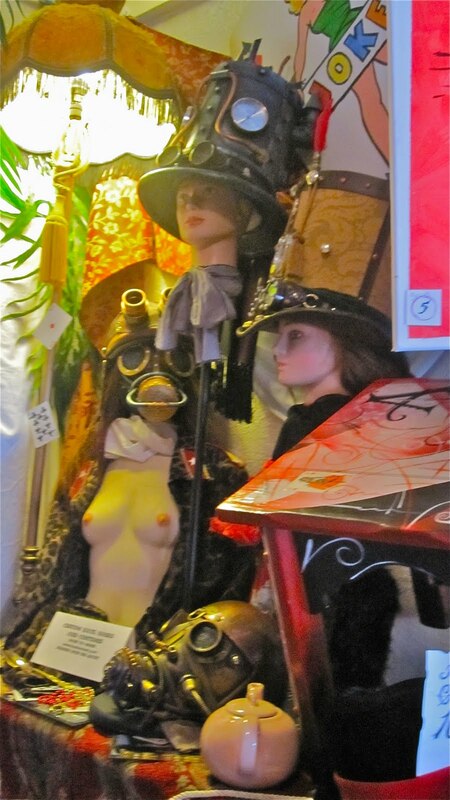 The hats and masks in this room were awesome, I wanted to try them on; the copper gas mask was the best. This room was a sensory overload, things were everywhere in the tiny space. the artist who created the room told us that he didn't want any negative space left in the room. He succeeded in that attempt. This room had a reputation to hold up from the previous rooms that we visited and it did not disappoint. Mark Hammond, Christopher Robin Blum and Sally Hanrahan had nice photos of Burning Man, Pyramid Lake, motel signs from around downtown Reno and much more. Erik Holland's room had some very nice paintings. The wildflower village also had some good rooms, the ones I liked at this location where the Japanese room and the room with the pans that had the bullet shells adhered to them. Its really cool to see found object art that is that well done, I would have never thought of making something like that. The Japanese room had some amazing painting of the nuclear explosions that happened after the earthquake and tsunami. 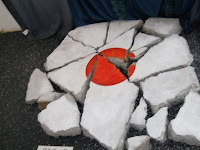 The piece I found the most striking was the Japanese flag painted on concrete that was broken into many pieces. The other work I liked was "Ka" the set of paintings that you couldn't avoid staring at. This is an event that you should see and support. I know I will be going next year. You can't beat it! It free, its friendly, its a good time for the whole family!! We need to more events like this in Reno. Thank you, Nada Dada!! The RN&R Newspaper boxes are done!!! !